This New Year’s Eve, Fairmont Peace Hotel will hold an exclusive charity ball, hosted by China’s most celebrated contemporary dancer and opinion leader, Jin Xing. The Peace Charity Ball will be an unrivalled night of exclusive entertainment with charity auctions in support of a great cause, the Shanghai Children’s Foundation. As the curtain falls on the end of another full year, the elites of Shanghai will be invited to Fairmont Peace Hotel’s glittering function room, Peace Hall, for the ball of the year. This event will redefine the meaning of celebration and establish the Peace Charity Ball as an annual fixture in the Shanghai calendar. The ball aims to be the grandest New Year’s Eve party Shanghai has ever seen and attract distinguished guests from all over the world, who will not only be able to enjoy an exquisite environment, premium service and world-class entertainment, but also contribute to a greater cause. 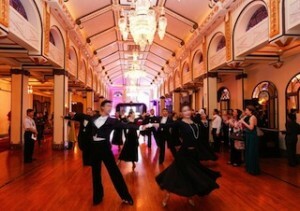 The Peace Charity Ball will be held in Shanghai’s most famous ballroom, the Peace Hall, located on the eighth floor. This restored hall is adorned with Art Deco detailing, crystal chandeliers and a 6.5-metre-high ceiling, and still has its original sprung white maple dance floor, which has been returned to a sparkling sheen. The host for the night will be Jin Xing, a true icon and opinion leader in the Chinese society. Trained as a dancer and highly decorated at an early age in the PLA, she founded the Jin Xing Dance Theatre, China’s first independent dance company, and led it to international acclaim, winning international recognition including an honorary doctorate in the UK and the French government’s Chevalier de l’Ordre des Letters et des Artists. Guests will be welcomed on the red carpet by Jin Xing and Fairmont Peace Hotel’s General Manager, George Wee at 6pm, and will enjoy an exclusive champagne and cocktail reception in the grand lobby before sitting down to an elegant dinner of their choice in either the Cathay Room or Dragon Phoenix, each dining room boasts perfect views of the magnificent Huangpu River. At 10pm, guests will gather in Peace Hall to dance, enjoy live performances and take part in the charity auction. At midnight, there will be a traditional New Year’s countdown, and then the dancing continues until 2am, with food and drinks on the house throughout the night. All proceeds from the charity auction will go to the Shanghai Children’s Foundation, a publicly run organization established in 1981 to support projects and research that are beneficial to the health and wellbeing of children. All money raised will go towards establishing a fund to help families with children of outstanding talent, who do not have the financial resources to further their child’s education. Fairmont Peace Hotel has designed three packages for local and international guests wishing to attend the ball. The Platinum Package priced at RMB38,000 includes a three-night stay in a Suite, complimentary 60-minute spa treatment for two, access to the Fairmont Gold Lounge, complimentary limousine service, complimentary items from the in-room mini bar and two tickets to the Peace Charity Ball, which includes a choice of an eight-course Chinese banquet or a five-course Western dinner and free-flow champagne and drinks all night. The Gold Package priced at RMB23,000 includes a one-night stay in a Fairmont Gold Room, access to the Fairmont Gold Lounge, complimentary limousine service and two tickets to the Peace Charity Ball, inclusive of dinner and free-flow of beverages throughout the night. The Silver Package priced at RMB13,000 includes a ticket to the Peace Charity Ball, inclusive of dinner and free-flow of beverages throughout the night. This New Year’s Eve, there is only one destination where the cream of high society can celebrate while touching the lives of those less fortunate. Join the global elites for what promises to be the most exclusive and spectacular social event of the year. For more information, please contact Ms. Jacqueline He at +86 21 6321 6888 or email jacqueline.he@fairmont.com.